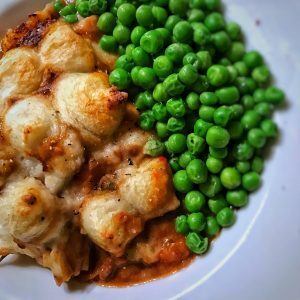 I served my pie with a portion of peas which are now 0sp on the new Flex Plan! 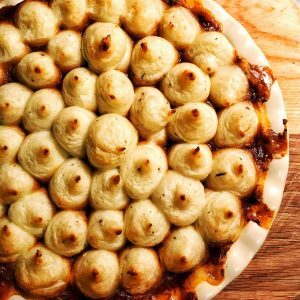 This recipe makes four big portions of cottage pie so is perfect for Sunday lunch or, for tea for 2 with leftovers for 2 the next day. Fill the kettle and pop on to boil. Pre heat the oven to 150c. Pop the beef in a large bowl, add the flour and season well with salt and pepper. Coat the beef completely in the seasoned flour. Add the oil to a large sauce pan, heat and then add the beef. Fry the beef for 4-5 minutes until the beef is sealed (but not cooked through). Remove the beef from the pan and pop into a bowl to one side. In the same pan add the onion, garlic, carrots and mushrooms. Fry for 4-5 minutes until the onions start to soften (add a little water if the pan starts getting a little dry). Add the tomato puree and Worcestershire sauce, fry for another minute and then add the beef stock and brown ale with a pinch of sugar. Add the beef back to the pan with the rosemary and thyme, stir and then bring to the boil. Reduce the heat and simmer the pie mixture for 1 hour until the beef and carrots are soft and the sauce has reduced nicely. While the filling is bubbling away, make the mash. Boil the potatoes in lightly salted water for 8-10 minutes (until the potatoes are soft). Then mash (or rice) in a large bowl until nice and smooth. Add the stilton, crème fraiche and skimmed milk and whip up until the mash is nice and smoot h and not too thick a texture. Season to taste with salt and pepper. Take a large pie dish and add the filling to the base. Then either spread the mash over the top or pipe on as I did. Pop in the oven for half an hour so the top of the mash goes nice and crispy. Remove from the oven and leave to rest while you make the peas. Finally, pop the peas on to boil for five minutes and then drain and season. To serve, add the pie to a nice deep bowl and add the peas. Another triumph Laura! Made this for tonight’s dinner and it was just divine!